<What’s Happening With the ‘Agnes Book’? An ABC News friend and former coworker commented on a recent photo I posted to Instagram. Part of the fun of being married, besides still feeling like a kid having a permanent co-ed sleepover, is receiving gifts. We registered for a couple appliances we hoped would help our creativity and productivity in the kitchen: the Cuisinart and the Kitchenaid. Thank you to two of my mom’s closest girlfriends for buying us each of these great additions to our apartment. Til now, my heart would always sink a little around Christmastime when cookie recipes called for “creaming” the butter. Or if I was craving a homemade marinara sauce. I always wanted these large kitchen toys, but just settled on waiting til I got hitched. Now, happily, I don’t have to skip these recipes. I face them head on with zeal. MainMan’s parents came to visit last month and we celebrated his mother’s birthday and his parents’ anniversary (both are on the same day) during their stay. I was determined to impress them with a few tasty treats. My mom bought me the magazine of Cook’s Illustrated’s All-Time Best Recipes of the past 20 Years. I highly recommend you ordering it online immediately. It has all the basics you need to start your cooking career off with a bang. What I love about Cook’s is it’s not just a list of instructions and ingredients. Typically, I Google or look up a recipe in an index and I follow it blindly with no idea what I’m doing or why, for that matter. Cook’s comes to a conclusion/recipe after a lot of trial and error, and they explain the methodology. They tell you why you’re doing stuff with simple scientific explanations: I never in a million years knew if I sliced eggplant, put the pieces in a bowl doused with salt and let them sit that a cup of water would seep out in 15 minutes?! My mind was blown. Unfortunately, I could not find a link to the recipe for any of Cook’s items (which means you have to buy the magazine), but the highlights are: let the eggplant sit and drain, the batter is made with parmesan and homemade (chopped with a Cuisinart!) 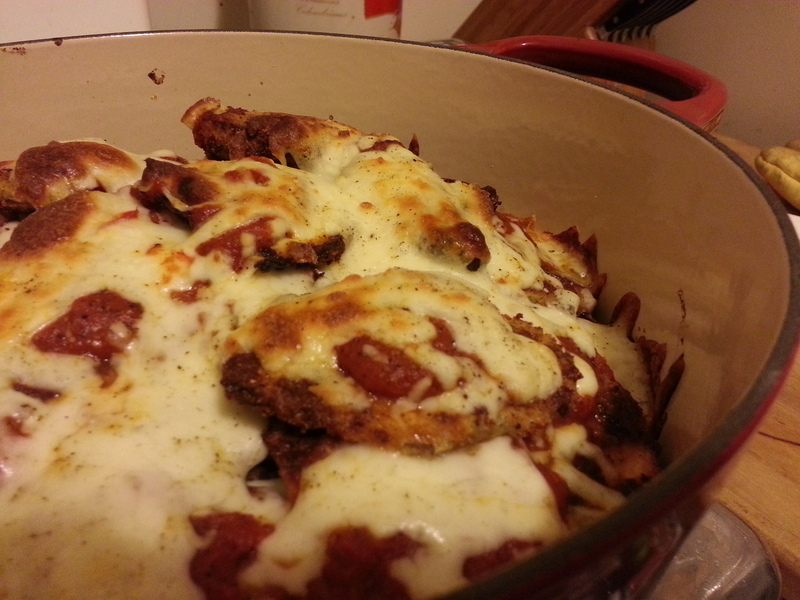 breadcrumbs, and forget the typical 9×13 dish. 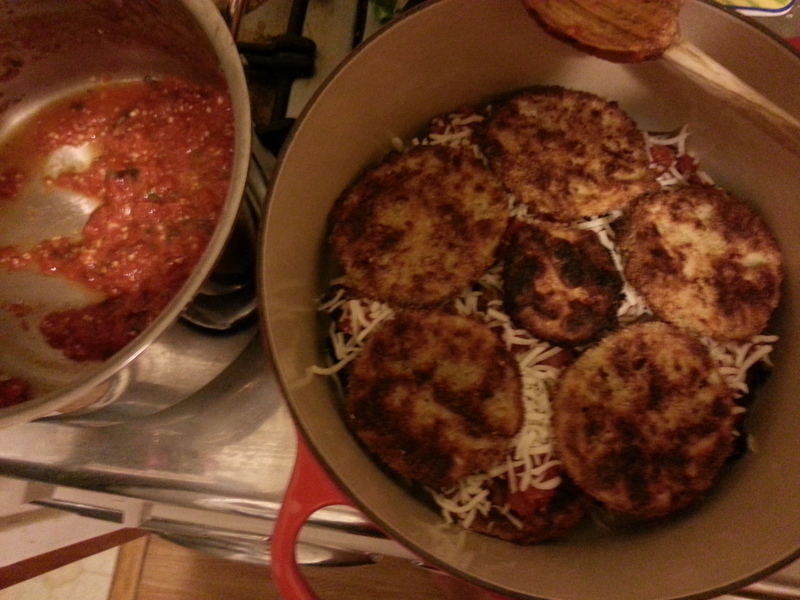 We put the eggplant in a round Dutch oven, about seven or eight layers deep and it was ridiculous! Lately, I’ve started receiving a beautiful magazine La Cucina Italiana. I have no idea how/why I started receiving it, but the photos are mouth-wateringly delicious and I fold the corners of at least a dozen recipes in every issue. As a pescetarian, vegetable lasagna is one of my favorite dishes, though I’m extremely picky about what goes in it. I am not a fan of mushrooms, carrots or julienned anything in lasagna. Blech. So when I saw this recipe with broccoli, zucchini, artichoke and asparagus, I was sold in an instant. Give it a whirl. She’s a beauty! 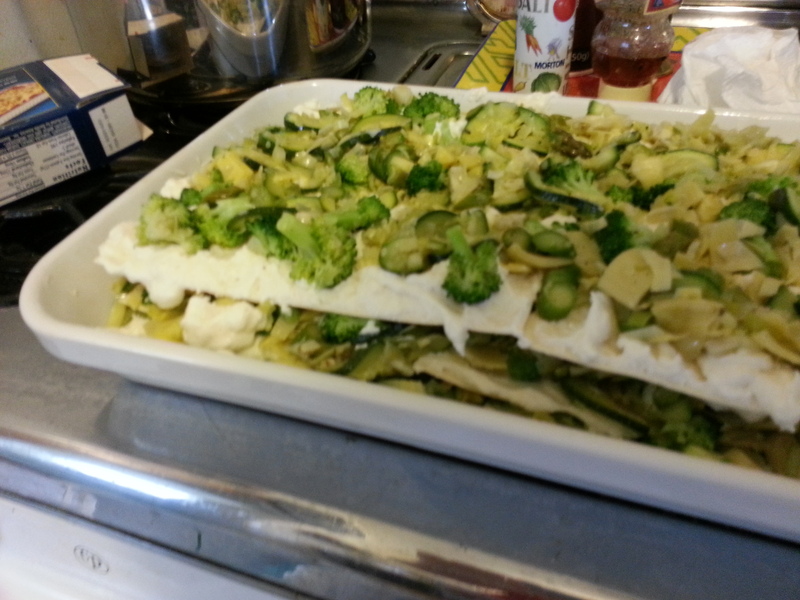 And here is the link: Spring vegetable lasagna. My mother-in-law serves pound cake cold and dense with a nice block of cheddar cheese. I never thought I’d like such a combo, but it’s very tasty, and I often find myself craving it. My mother always talks of her mom loving apple pie and cheddar cheese, so I suppose there are stranger combinations. I attempted my mother-in-law’s pound cake recipe for the first time and while it wasn’t a homerun, it was a solid 7 out of 10. (Hers is ALWAYS a homerun, so something screwy happened on the way to the Kitchenaid). Mine was a bit on the crumbly/dry side, but once we kept it in the fridge for a day or two it was great. We froze half of it and I’m about to dive into a piece. Forgive the chunk gone missing. 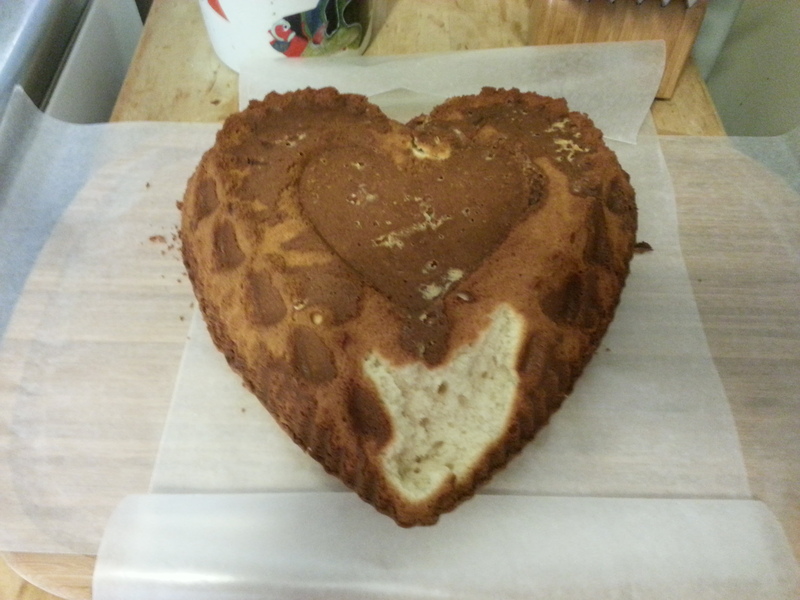 I had a heart-shaped bundt tin and used it for her birthday cake. Voila! Pesto has always been one of my favorite pasta sauces. And the latest issue of La Cucina Italiana conveniently highlighted pesto sauces. 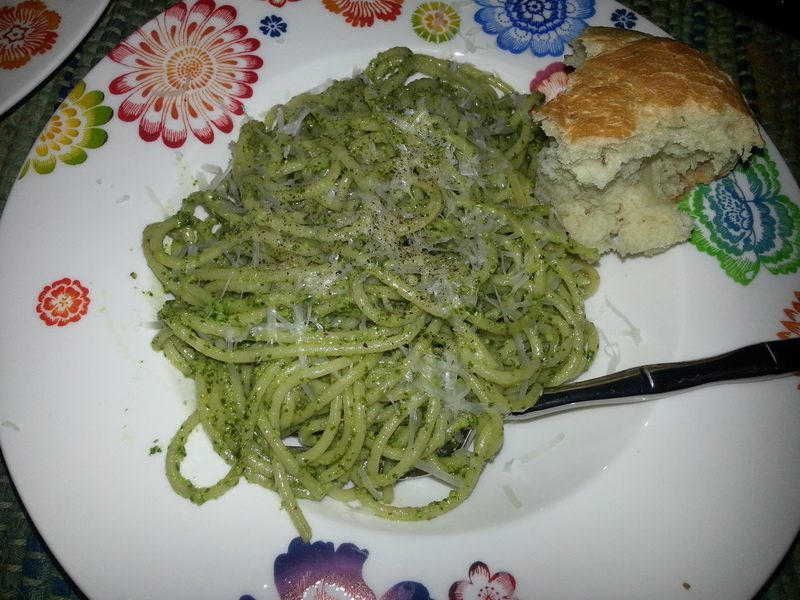 We attempted one, and while it was certainly yummy as a first homemade pesto, it left a little to be desired. Here is the link to the recipe: Pesto sauce. Lastly, if life throws you brown bananas, make banana bread. And with some leftover chocolate chips, mmm mmm mmm, I made a great banana-chocolate chip bread that was a huge hit. Also from the Cook’s Illustrated magazine. E-mail me and I can type up the recipes for you from Cook’s if you so desire (eggplant parm, choco cookies, banana bread). And I can also send you my mother-in-law’s fabulous pound cake recipe. oooh that’s a great tip, danica!!! yeah, struggled with this pan. the butter on the paper towel method didn’t quite prove to be very effective. If you love whipping and creaming in your kitchen aid, I have a great poppy chiffon recipe. 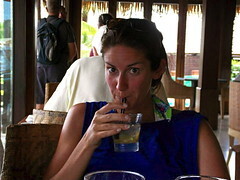 It’s been in my family a long time and it fabulous.